As I was working on my latest project – yes, a cocktail dress – I thought about all the possible declarations we, as sewers, could add to the vocabulary of toasts. More about those thoughts later… First up is something to wear to that cocktail/dressy party! 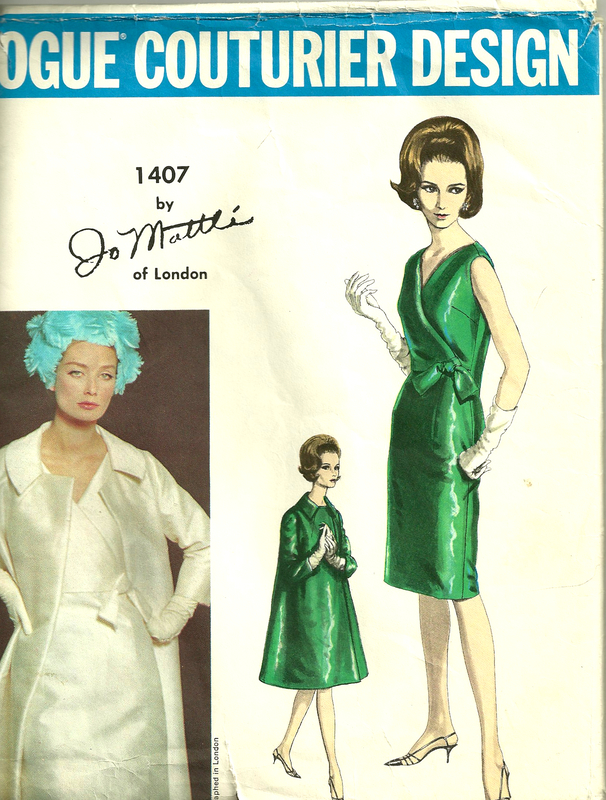 This Vogue Designer pattern is from the early 1960s. 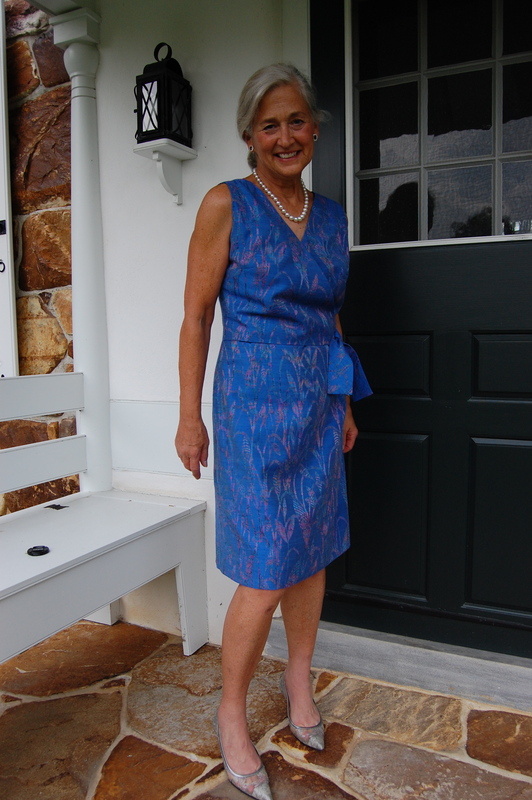 The lengthy process of perfecting the muslin (toile) for my blue cocktail dress revealed a few minor changes I needed to make – four of them, to be exact. You might be able to see on the pattern envelope, that the “overblouse” in the front actually hits about an inch above the waistline. This just did not look good on me, so I extended the length of those two over-lapping fronts an inch so that they would lay directly at my waist. Second, the under-dress, the top of which is not seen when being worn is cut low so that it does not show beneath the “V” of the overblouse. However, it was cut much lower than I needed, so I raised it a bit. I thought the shoulders of the overblouse extended a little bit too wide, so I cut the top of the armscye in about ¾ of an inch, graduating it down to join the lower part of the armscye. 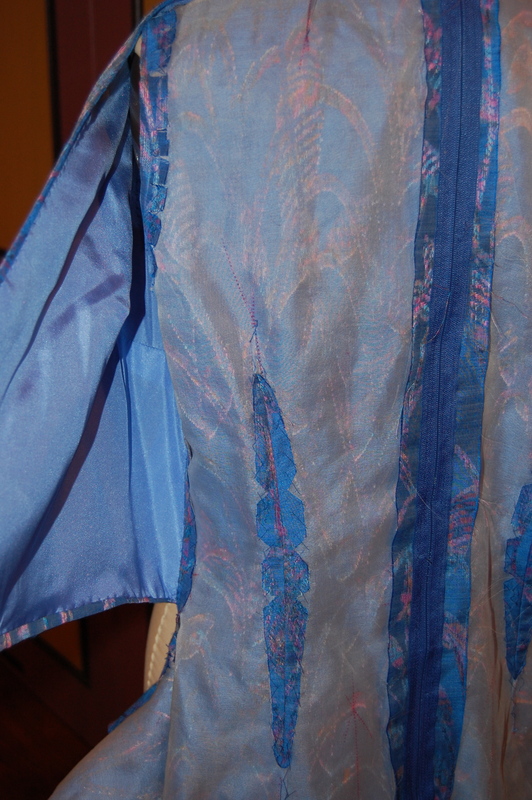 And fourth – I added a slit at the lower back center seam to make walking easier. I seem to do this frequently with vintage patterns. The pattern called for the fashion fabric to be underlined, but not lined. I wanted to line the dress – and actually felt it was a necessity with the fabric I was using. Because of the unusual construction of the dress, I knew that this was going to be interesting – and that I was going to have to make it up as I went. 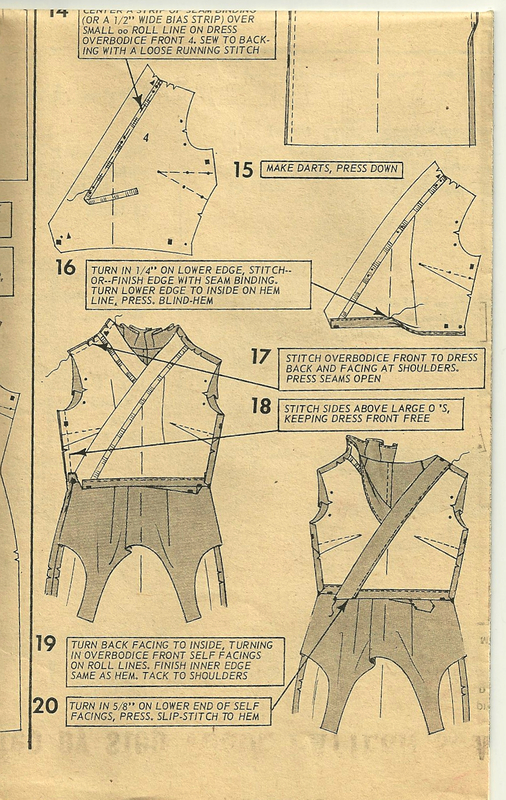 To see what I mean about the unusual construction, take a look at the pattern instructions. The front of the “underdress” is sewn to the back of the dress at the side seams only to the waistline. 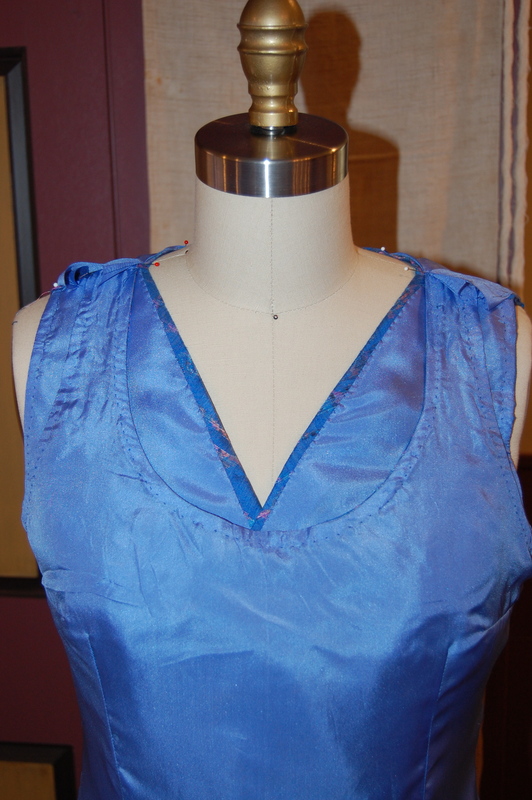 The bodice part of the front “underdress” hangs loose while the two sections of the overblouse are first sewn to the dress back. Then that bodice is hand sewn in place. 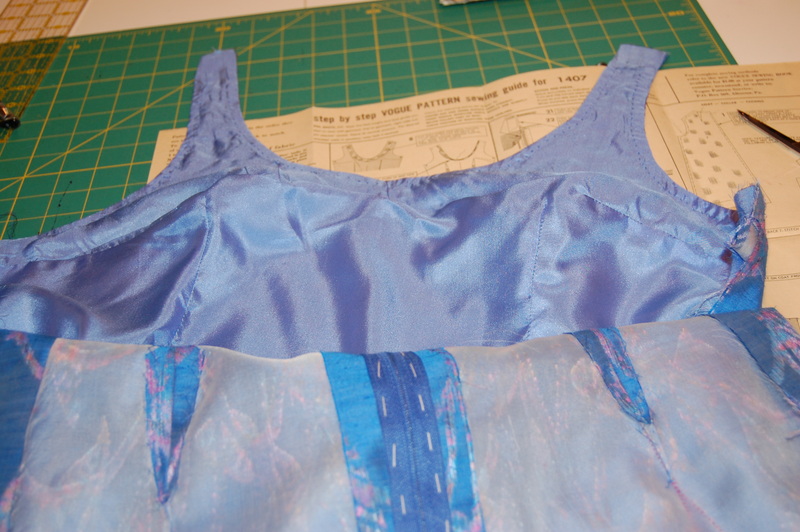 To line the dress, I first sewed the lining to the front underdress at the neck and the armscyes by machine. I under stitched these sections by hand, leaving about an inch free on either end. Next I lined the two front overblouse sections, stitching only the front armscyes by machine; I attached the rest of these linings by hand, using fell stitches. Then I joined the overblouse sections to the (unlined at this point) dress back. The front overblouse sections are attached to the side seams, but the front underdress is hanging loose, visible at the lower left. I had pieces of dress and overblouse and lining hanging every which way! Any of you who have made a “Chanel” type jacket know how unruly the process is before the lining is seamed in place by hand. This reminded me of that. Somehow I would have to make order out of chaos! 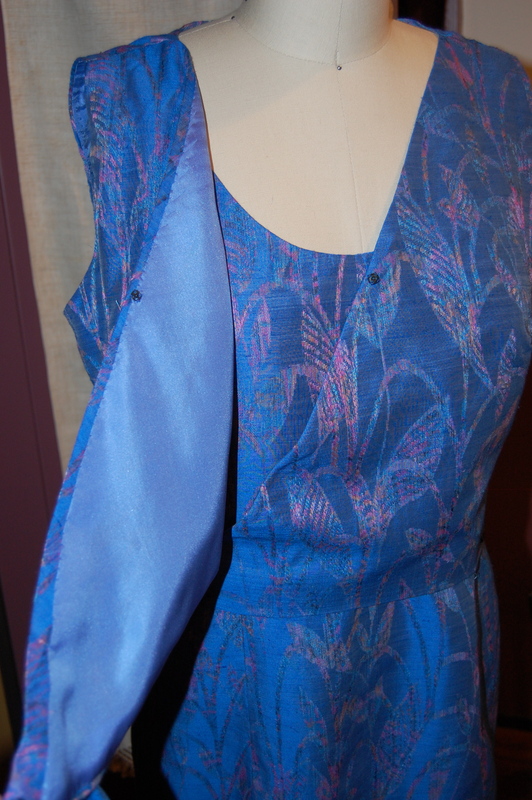 To line the back dress section, I pinned the lining to the armscyes and neck and fell stitched in place by hand. Then I was able to sew each side seam on the machine. The shoulder seams were the final ones to finish, which I did by hand. Then it was only a matter of fell stitching the lining to the hand-picked zipper and understitching the neck and arm sections. 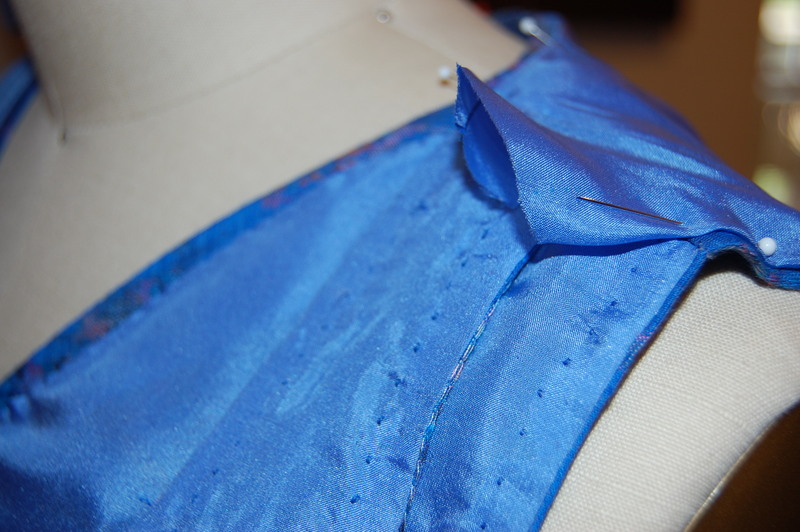 The shoulder seam encloses two finished layers in front. It worked! The lining fit perfectly and made for a pretty “insides”! An inside look at the underdress and the overblouse. 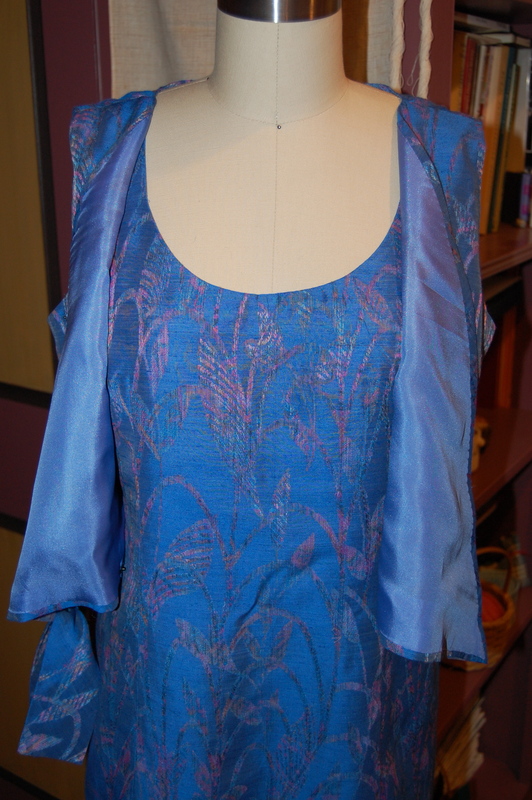 The pattern called for tacking the front overblouse sections to the underdress, but I decided to use snaps instead. Ironing this dress will be so much easier with the overblouse sections opened up. However, I did permanently tack the looped tie in place, as indicated in the pattern directions. There was much more hand sewing involved in this dress because of the added lining, but the process was so rewarding in the end. I anticipate this dress being perfect for not only cocktails, but also weddings and other dressy occasions (particularly if I get the coat made, too!). I love that fabric – your dress is fabulous. The coat would look great, too. And I like that the dress will get plenty of wear – it’d be a pity to put in all of those hours of work for just one wear. For me, if I was invited to a party where guests were going to be wearing something that they’d made, that would be half the fun. I’m usually (if not always) the only one at a party that sews for themselves. Thank you, Dustin! If, by chance, someone at a party finds out I have made what I am wearing, I become an object of appreciative curiosity! I can’t imagine how much fun it would be to be at a party with lots of other self-sewn guests! I’d bet that they get especially curious when you tell them your dress is made from a Vogue Couturier pattern from the 1960s. Lovely dress and the adjustments made it outcome even more successful. Looks lovely! Cheers to you, and may your bobbins never run out! Thank you! Ah, those pesky bobbins… Now that IS a good toast! It turned out beautifully! I can’t wait to see the coat you plan to make to go with it! I’ve often heard knots in handsewing thread blamed on thread fairies dancing on it. So cheers! And may the thread fairies not dance on your thread! Beautiful! Your attention to detail is exquisite. I can’t wait to see the coat. Thank you, Jane! So far, I know I am lining the coat with the same fabric that the dress is in, but I am still searching for the outer fabric! Very pretty! And blue is my favourite colour! Such an intricate dress. Thank you, Linda. I am very partial to blue as well! As always, you did an impeccable dress. All of your attention to detail really shows in the finished dress. Hope you make the coat too as I think it would be an amazing ensemble! Thank you, Cissie. I will definitely be making the coat, but need to find the “exterior” fabric for it first. I love the clean lines of the coat pattern which could lend itself to some interesting fabric. The search is on! I’ll drink to that! I love your fabulous dress, it’s so pretty! Thank you, Marianne, for your much-appreciated compliment! To our sew able selves indeed! Fabulous dress. Thinking ahead to make it easier to iron the dress — you are brilliant! All your ingenuity made for a superb result — and having an overlapped bodice that can’t gape: that is real luxury! Brava! I love the thought that the pattern is 50 years old, but the dress design is so current. I also love how sewing gives us the autonomy to make simple changes, which make things like ironing easier! Now you must make a dress from this pattern for yourself! Mine was only one size too large, which was a manageable fix. Three sizes too large would be a challenge for me. I have started to look for fabric for the coat, which is moving up on my priority list! So nice to hear from you! Such a beautiful dress and a very good story!! Enjoy wearing your beautiful creation. Thank you, Jackie. I actually just wore it a couple if days ago – and felt very stylish! Oh, I like that toast, Mel! So many of the styles from the ’60s are elegant, making them a treat to recreate. Karen, you outdid yourself here! Genius technique on the lining as well and you look radiant in this lovely shade of blue. C h e e r s to you! Thanks, Sarah! I am very partial to this color of blue… Hope your post-wedding cough and cold are now past. To Our Noble Sewist Extrodinaire! It is exceedingly beautiful in form and execution and the color is perfection. Flags flying and glasses hoisted in full. Arrrgh. It would help if the Toast-meister could type “extraordinarie” property. Thank you, thank you! A clink of the glass to you, too! Ah, I knew exactly what you meant! So beautiful and such attention to detail…I hope a cocktail party comes up very soon! Cheers! Thank you, Sheila! I have already worn the dress and look forward to wearing it again, hopefully soon! Beautiful dress and fabulous workmanship. It looks as current as it did 50 years ago. I hope we get to see the matching coat. Isn’t it amazing how current the ’60s’ styles are? I so enjoy sewing from these vintage patterns, which just seem to have those little extra details which make the finished product just a little more classy. Lovely! Worthy of a flute held high in salute! How lovely to think of that – thank you!